Round out your look with this sleek and circular Clare V. crossbody we (and everyone else) can't get enough of this season. 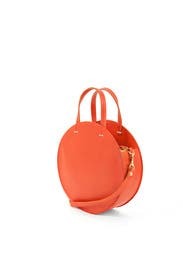 Also available in Green, Navy, and Croc. 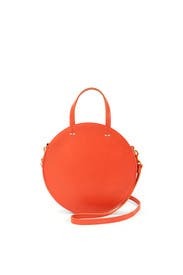 Poppy veg leather round satchel with top handles and crossbody strap. Top zipper closure and interior zipper drop pocket. 9.5" in diameter and 3" deep.